To support to our ministry financially you can use the ‘Donate’ button below. If you wish to designate a specific purpose for your donation, the Paypal form gives an important option to add an appropriate note. For example you might write: ‘Sponsorship for Summer Camps’ or ‘Payment for Retreat’. Any unspecified donations will go by default to FSSP England. 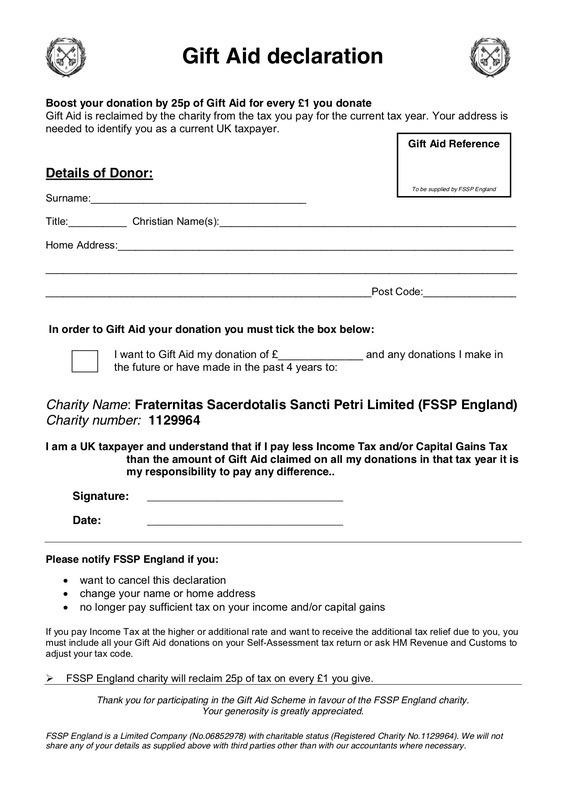 If you are a UK tax payer then FSSP England may be able to claim an extra 25pence from the UK government for each £1 that you donate. Please click on the image to the right to download a Gift Aid Declaration form. The completed form should be sent to St Mary’s Warrington, Smith St, Warrington, WA1 2NS.